According to Forrester Research, more than 32 million U.S. consumers are now using an assortment of devices to watch Web video on their TV sets, from gaming consoles to set-top boxes like Apple TV, Roku and Google TV. These are often considered interim devices, while “smart” TVs –- ones that are always Internet-connected –- ease their way onto the market and into living rooms. But adding these boxes to your TV setup means factoring in more wires and easy-to-lose remote controls. And finding the right input for the device through the TV remote can leave even the smartest people feeling dumbfounded. 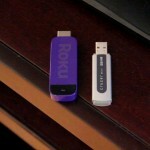 Roku, the California-based company that makes set-top boxes of the same name, has come up with a new solution to this: A wireless stick, not much bigger than a thumb drive, that plugs directly into the back of your TV to stream HD video from the Web — turning your “dumb” TV into a smart one, with minimal gadgetry. The $100 Roku Streaming Stick, available through Roku.com or Amazon.com, offers the same Web apps and the same powerful processor as Roku’s top-of-the-line set-top box, the Roku XS 2 (also $100). This means that all of that streaming goodness is packed into a small stick. The Roku Streaming Stick also responds to the same remote used for your TV, as well as to a remote control app for iPhone and Android smartphones — eliminating the need for at least one extra remote. But there’s one major catch with the Roku Streaming Stick: It only works with a certain type of TV set, one that includes an MHL (Mobile High-Definition Link) port. While Roku’s CEO Anthony Wood says that the company expects to see more of these TVs on the market within the next year, there are currently around 50 sets and displays sold in the U.S. that are MHL-equipped. 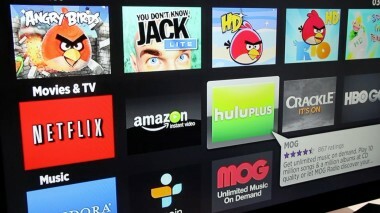 And, of those, Roku has certified only a few brands that work really well with the device: Insignia, Apex and Hitachi. In order to test the stick, I had to shift my regular TV set to the floor and set up a television that Roku delivered to me: A 55-inch, HD Insignia TV that costs $900. Normally, I wouldn’t replace my existing TV with another one just because I wanted to attach a $100 gadget to it, and I’m guessing a lot of consumers would feel the same. But the plug-and-play stick is convenient. It’s a few inches long and weighs just three ounces. 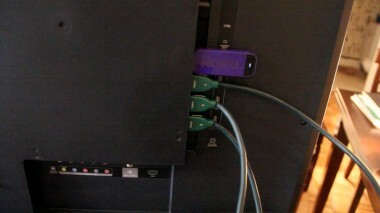 It’s bright purple, and plugs directly into a color-coded MHL port on the backside of MHL TV sets. It has no wires, and one of the benefits of this technology is that the MHL port actually charges the product while it’s plugged in, so there’s no need to charge the stick at any point. The set-up took all of 10 minutes: I plugged the stick into the TV, authenticated the device and registered with Roku on the Web. Roku says it has more than 500 apps, which it calls “channels,” on its platform, including popular apps like Netflix, MLB.tv, Hulu Plus, Amazon Instant Video, Vudu and Facebook. 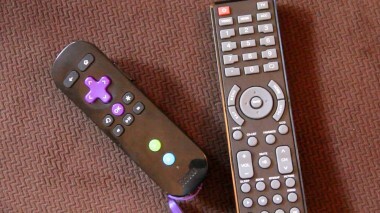 Both the Roku XS 2 box and the stick come with Angry Birds, which can be played using Roku’s motion-sensor remote. Over the past week, I’ve watched a lot of shows and movies through the Roku Streaming Stick, mostly through Netflix, Amazon and Vudu (the last two charge per movie rental or download, unlike Netflix’s monthly subscription). I also listened to NPR radio, streamed music through Pandora and logged into Roku’s bare-bones Facebook app, which lets users view photos and videos, but doesn’t allow for status updates. The media-streaming quality was very good. Occasionally, HD movies would pause to buffer, but never for longer than a few seconds. Only one movie channel I checked out, Sony’s Crackle channel, paused consistently, to play short ads. This was annoying, but then again, the Crackle movies were free. 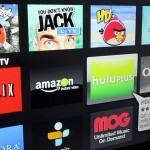 One app missing from Roku’s offerings is YouTube. I’ve spent more hours than I care to admit using Apple TV to watch YouTube videos with friends. Roku also doesn’t have a Web browser. And this might seem obvious, but you can’t watch media you’ve purchased through iTunes or the Google app store on Roku’s device, either. Lastly, cable-authentication apps that require a user to have a cable subscrition — like HBOGo or Epix — will only work on Roku with some cable providers. For example, DirectTV and Comcast do not support HBOGo on Roku. Time Warner Cable, however, does. As with other set-top boxes, text input is clumsy: You use the arrow keys on the remote to select individual letters of the alphabet. But you don’t actually need the Roku Streaming Stick’s own remote unless you want to play Angry Birds or other games that use motion control. 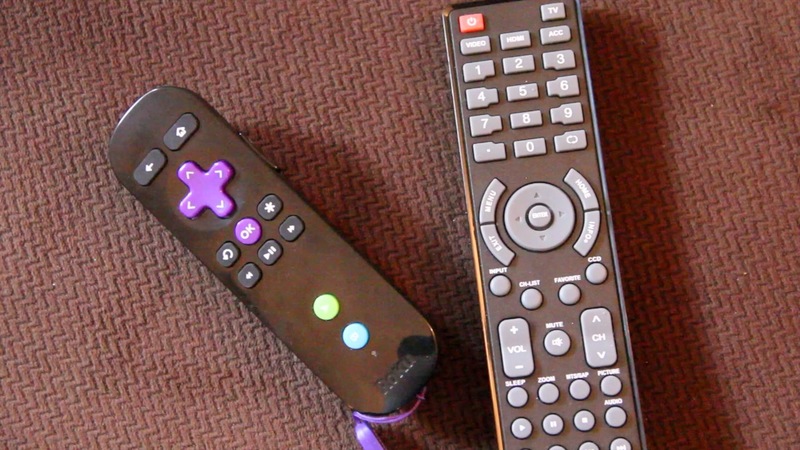 The Stick is compatible with the MHL TV’s remote, so I could access and navigate Roku by pressing the “Home” button on the Insignia TV’s remote and using those arrow buttons. Being able to just press “Home” to get to the Roku stick was joyfully simple compared to the usual process of searching my TV inputs for different devices I’ve connected to it. 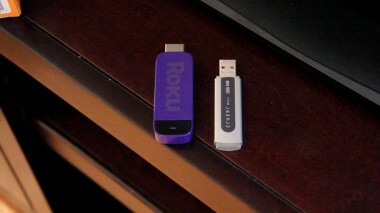 Roku also offers new iOS and Android apps that control the Roku Streaming Stick. Much like Apple’s AirPlay feature, I could use the Roku mobile app to stream the many photos stored on my iPhone directly to the TV set, provided that both devices were connected to the same Wi-Fi network. 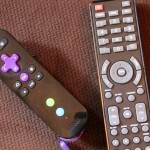 The Roku Streaming Stick successfully compresses the experience of a Web video box into a tiny, convenient device, but it comes with a lot of “ifs.” Even Roku says that its Stick may eventually be sold as a bundle rather than as a singular gadget. If you prefer Roku’s channel offerings over other set-top boxes, if you have an MHL-compatible television set and if you’re not planning on upgrading to a high-end smart TV with built-in Internet capabilities anytime soon, it’s a great device. Otherwise, right now it’s a niche product.